A perfect spiral leaves the turning hand of the quarterback. His receiver, twenty yards downfield, stretches out his body in a futile attempt to reach the spinning ball. "Incomplete!" shouts the referee. 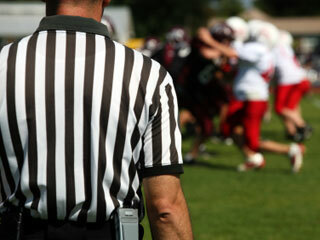 Immediately, the frustrated receiver turns to the referee claiming that the defensive back interfered with him in his effort to catch the ball. The giant screen at the stadium and the instant replay cameras on television repeatedly show the play in slow motion. The fans, coaches, and the other players on the team of the allegedly offended receiver burst forth in a cacophonous declaration that a defensive foul had been committed. Does the referee change his call or stand firm? In studying over three thousand matches in Europe of the "other" football - soccer, Professor Thomas J. Dohmen, in an article for Economic Enquiry, concluded: "referees' objective judgment capabilities are impaired by the emotional atmosphere in the stadium." He was looking to determine whether or not the notion of the "home field advantage" really did exist. He named his finding the "social pressure hypothesis." If we upgrade this study to moral decision making, I wonder what conclusions would be revealed. How much does the influence of the culture of the times affect, for good or ill, the workings of the individual conscience? I believe that the answer resides in the strength of that conscience and of the source of the influence. The pressure to react in a particular way may be positive or negative. If the response is virtuous, the power of faith and the strength of will to act virtuously prevailed. It is just that simple. With every Act of Contrition, however, and with every trip to the confessional, we appreciate the 'not so simple" weakness of the human spirit and the need of God's mercy. Yet, sweet victories can be and are won. Underlining this link between positive pressure and individual action, there was a past story from the Associated Press about personal tragedy, team solidarity, and group compassion. At the age of 39 Clarlitha Franklin died of cancer. Her son Johntel, senior captain of the Milwaukee Madison High School basketball team, was expected to play against DeKalb High School from Illinois. The two schools had established a friendly rivalry. Often, they would have a pizza party together after the game. On hearing of the death of Johntel Franklin's mother, they were thinking of canceling the game, but Johntel wished them to play. In fact, during the game Johntel himself appeared and wanted - needed - to play. The referee informed the coaches that Johntel was not on the roster at the beginning of the game and a technical foul would have to be called if he played. This rule gave DeKalb two free throws. Dave Rohlman, the coach of DeKalb, protested the necessity of the technical, but he had to concede to the rule. Coach Rohlman asked if any of his players wanted to take the shots. From the DeKalb bench, Darius McNeal volunteered knowing that the coach, the team, and all of the fans wanted him to purposely miss the two shots. That he did. Milwaukee Madison went on to win the game. Afterward, the two teams eat a meal together and expressed their sorrow for the death of Johntel's mother. The long ride from Wisconsin to Illinois would have been a quiet one for the losing team. But for the DeKalb High School basketball team on that night, that glorious night, were all elated to be true champions of what real sportsmanship means and of what human compassion and love can produce. Lent presents the opportunity to develop and strengthen the skills required to live this life and to leave it as winners. Regarding the "social pressure hypothesis," I recommend submitting to the influence of a heavenly society and their pressure expressed in the Preface of the Mass of All Saints Day in which we are comforted by the fact that the saints are spurring us on to victory. May Claritha Franklin be among them.